Background: Gene Regulatory Network (GRN) inference algorithms aim to explore casual interactions between genes and transcriptional factors. High-throughput transcriptomics data including DNA microarray and single cell expression data contain complementary information in network inference. Objective: To enhance GRN inference, data integration across various types of expression data becomes an economic and efficient solution. 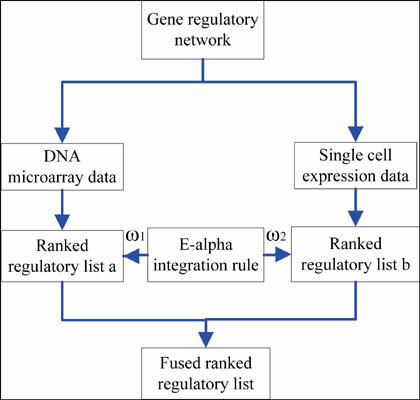 Method: In this paper, a novel E-alpha integration rule-based ensemble inference algorithm is proposed to merge complementary information from microarray and single cell expression data. This paper implements a Gradient Boosting Tree (GBT) inference algorithm to compute importance scores for candidate gene-gene pairs. The proposed E-alpha rule quantitatively evaluates the credibility levels of each information source and determines the final ranked list. Results: Two groups of in silico gene networks are applied to illustrate the effectiveness of the proposed E-alpha integration. Experimental outcomes with size50 and size100 in silico gene networks suggest that the proposed E-alpha rule significantly improves performance metrics compared with single information source. Conclusion: In GRN inference, the integration of hybrid expression data using E-alpha rule provides a feasible and efficient way to enhance performance metrics than solely increasing sample sizes. Keywords: Gene regulatory network, ensemble inference, gradient boosting tree, data integration. Keywords:Gene regulatory network, ensemble inference, gradient boosting tree, data integration. Abstract:Background: Gene Regulatory Network (GRN) inference algorithms aim to explore casual interactions between genes and transcriptional factors. High-throughput transcriptomics data including DNA microarray and single cell expression data contain complementary information in network inference.